maining undeveloped spaces in EB; its grasslands and shrubs attract migrating songbirds and butterflies. East Boston Greenway, Piers Park to Constitution Beach This shared use pathway connects EB's inner harbor with Boston's outer harbor. Originally a railroad track, the land that comprises the Greenway became a dumping ground in the 1970s when the tracks were abandoned. The local Chamber of Commerce wanted to use the land for a truck route to Logan, but EB residents had other ideas. They cleaned up the tracks, and, in 2007, the Greenway opened. Today you can walk run, or bike, from PIERS PARK to CONSTITUTION BEACH. Along the way you can stop in the beautiful EAST BOSTON LIBRARY, discover murals that celebrate EB's past, play Bocce Ball at BREMEN STREET PARK — a former off-airport parking lot that has recently been transformed into an active-use park, pay your respects at TEMPLE OHABEI SHALOM CEMETERY, established in 1844, which enabled Jews to be buried in Massachusetts for the first time, and swim, fish, and build a sandcastle on a sandy beach. Eventually the Greenway will extend to BELLE ISLE MARSH, Boston's largest remaining salt marsh, which has recently been restored by Urban Wilds. But don't wait until then to visit this urban oasis! Today, you can watch the tide flowing in and out of this upper coastal intertidal zone, which is home to many plants and animals, from a beautiful pedestrian pathway. Maverick Square MAVERICK SQUARE was the center of EB's early commercial and banking businesses. Today, MAVERICK MARKETPLACE, the first incubator space in EB, reflects the neighborhood's changing economy. 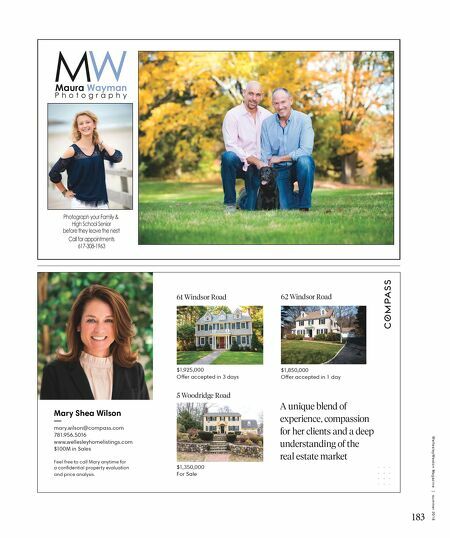 Stop in and support these growing businesses, which include the MAVERICK MARKETPLACE CAFÉ, where you can savor a coffee and a bite to eat, while enjoying live entertainment. The arts are an essential part of EB's new economy. ATLANTIC WORKS GALLERY, a vibrant collaborative venue for art and ideas located in an old warehouse and along a pier on Broad Street, is not to be missed. 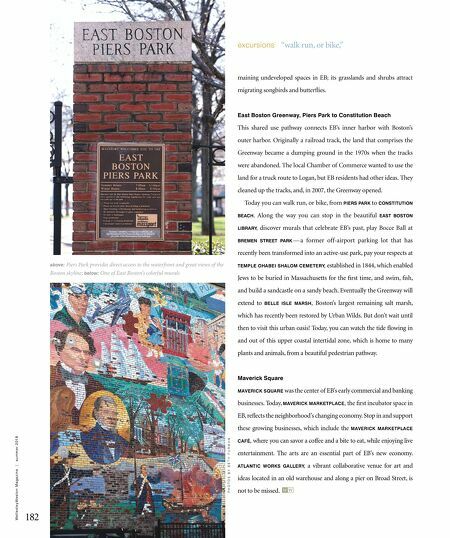 P H O T O S B Y B E T H F U R M A N above: Piers Park provides direct access to the waterfront and great views of the Boston skyline; below: One of East Boston's colorful murals 182 W e l l e s l e y W e s t o n M a g a z i n e | s u m m e r 2 0 1 8 excursions "walk run, or bike,"